Mark Graham contributed scans of these sheets of original Alfred Alcala art that he owns. 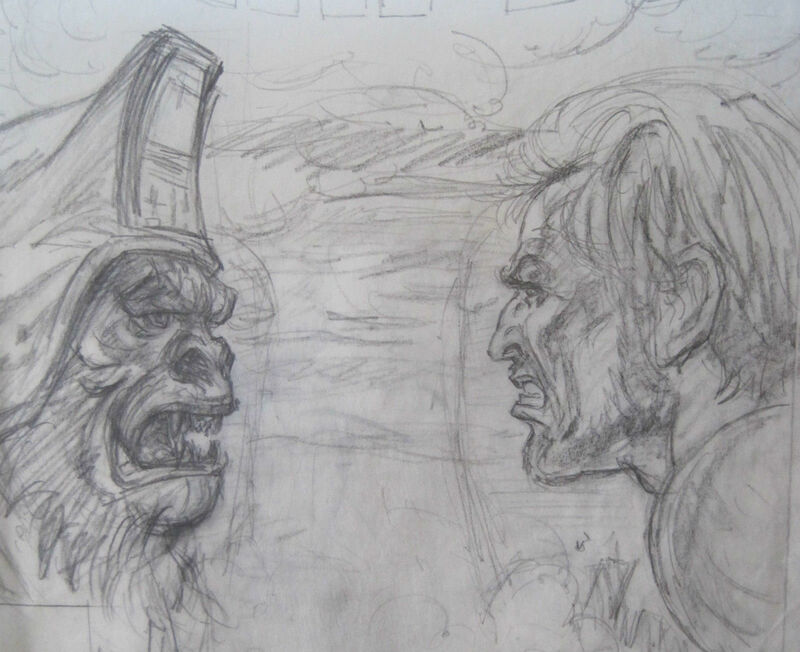 Mark wrote, "They're Alfredo Alcala's original art for the Marvel adaptation of Conquest, issue 19, pages 34-36 respectively." 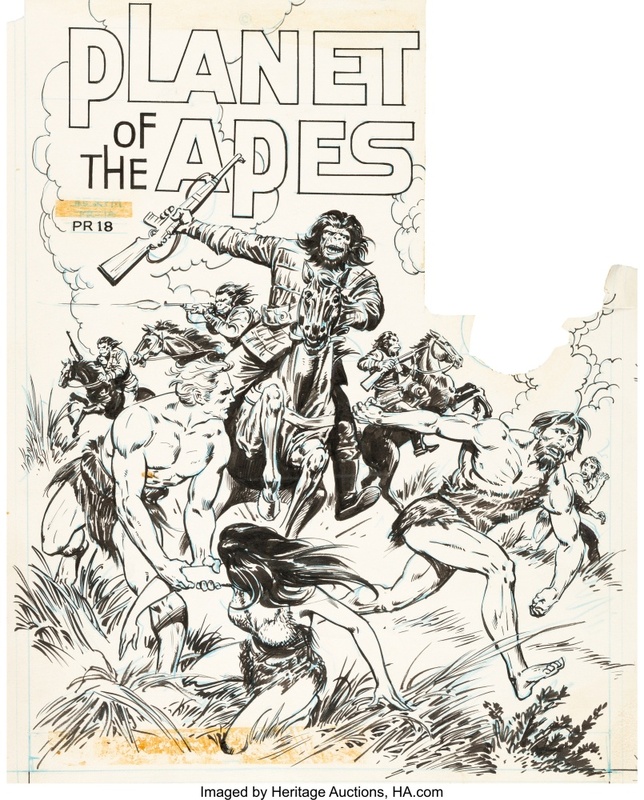 A few sheets of Earl Norem's original cover art for the Marvel Apes magazines were auctioned on eBay in 2013. 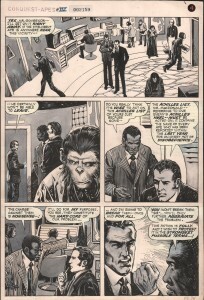 These images were taken from the auction listings. In January 2015, another Earl Norem piece was posted on eBay. This was the accompanying text for the auction. 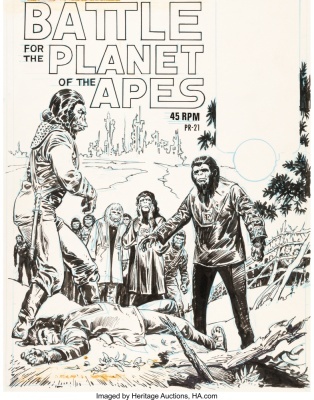 Never before offered for public sale, this auction is for a finished pencil used to produce the cover of the December 1976 #11 issue of PLANET OF THE APES Marvel Comics entitled FOR APE AND MANKIND IT'S THE FINAL CHAPTER?! 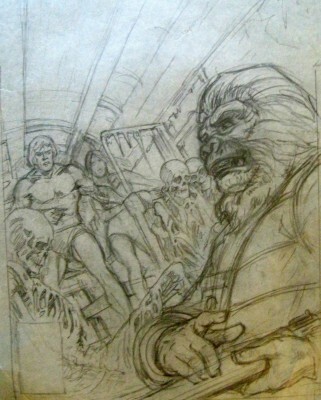 There's a bit of a mystery here...Earl submitted this pencil during his long association with Marvel. 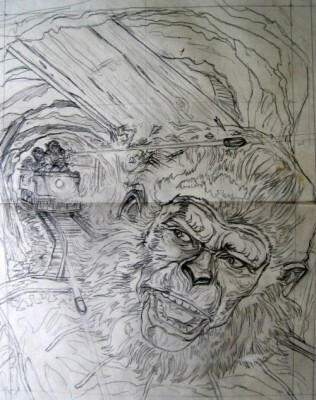 The majority of Earl's work were cover paintings for Marvel comics and books. 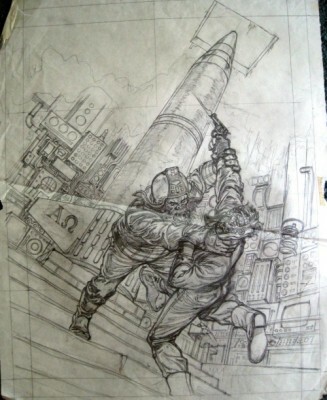 Earl explained that on rare occasions he was heavily involved in another project and could only create the concept pencil design. 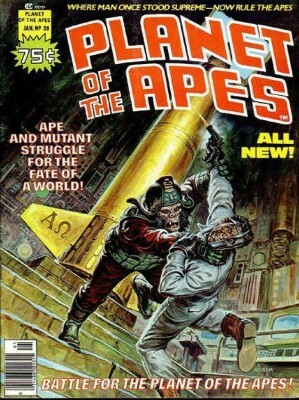 However, he is not listed nor given credit for the cover art in this comic issue. 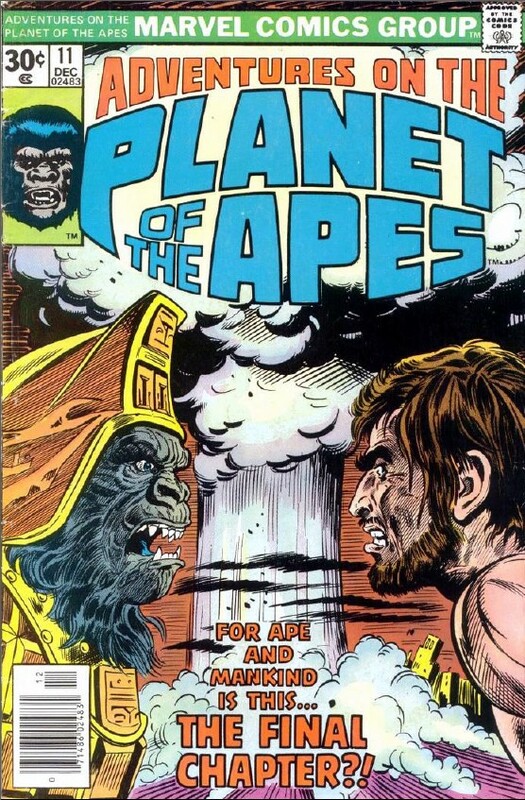 Perhaps an oversight as comic production was constantly under the gun to meet deadlines. 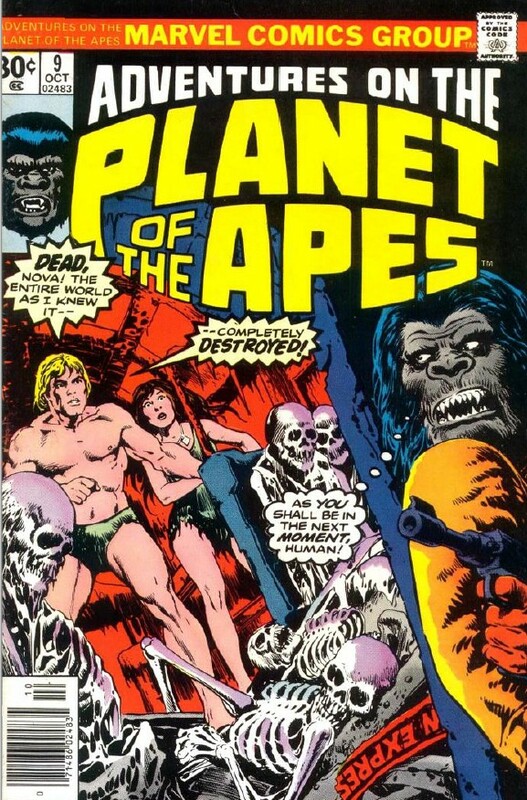 Another possibility is that it was more affordable for Marvel to produce the cover this way rather than paying for a detailed painting. Anyway, this is a great image featuring profiles of a snarling Charlton Heston and an angry Ape. 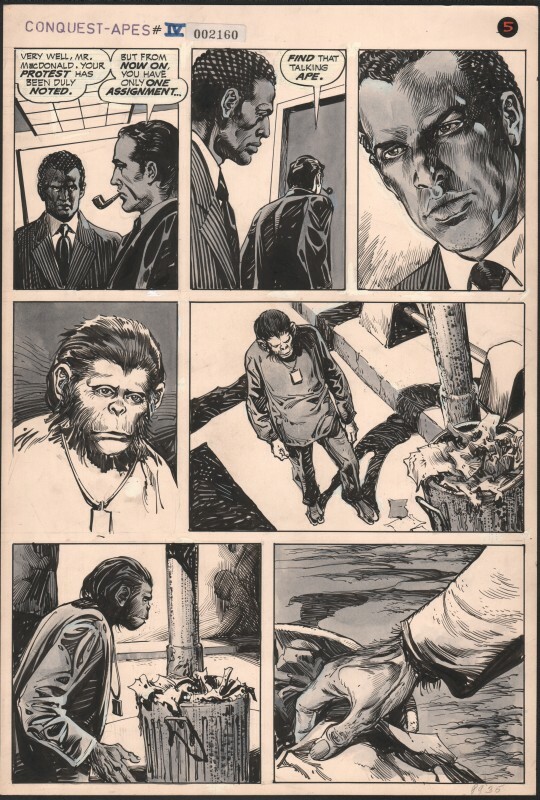 I have included a scan of the published comic for reference only. It is not included in this auction. The paper measures 11 x 19 inches. The image measures 10 x 11. The art is signed. 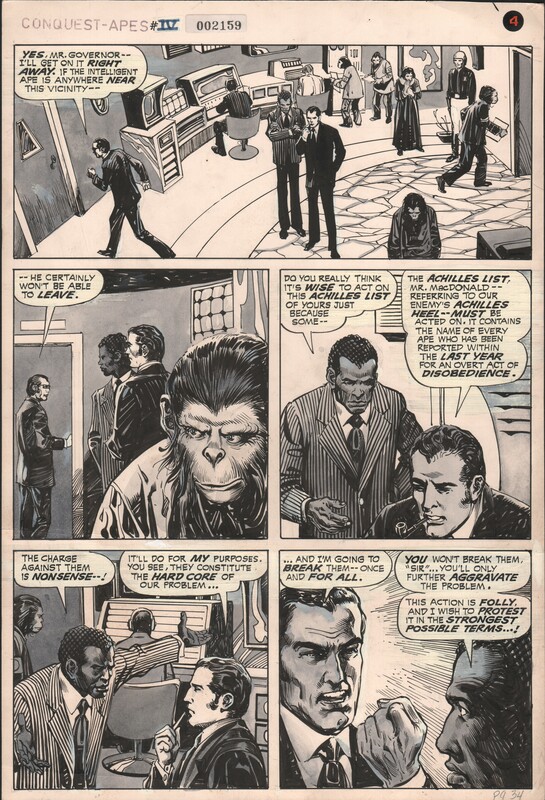 Mike Ploog Planet of the Apes #8 Page 21 Original Art (Marvel, 1975). 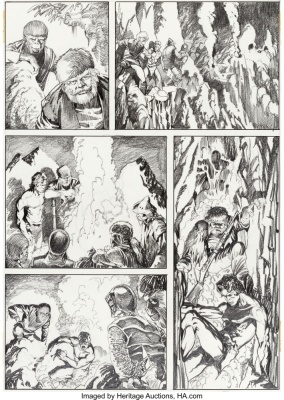 Look closely and you'll see that there's treachery afoot on this page from the black & white magazine-format series; look even closer and you'll notice that the "mountain man" character is the spitting image of Ploog himself. 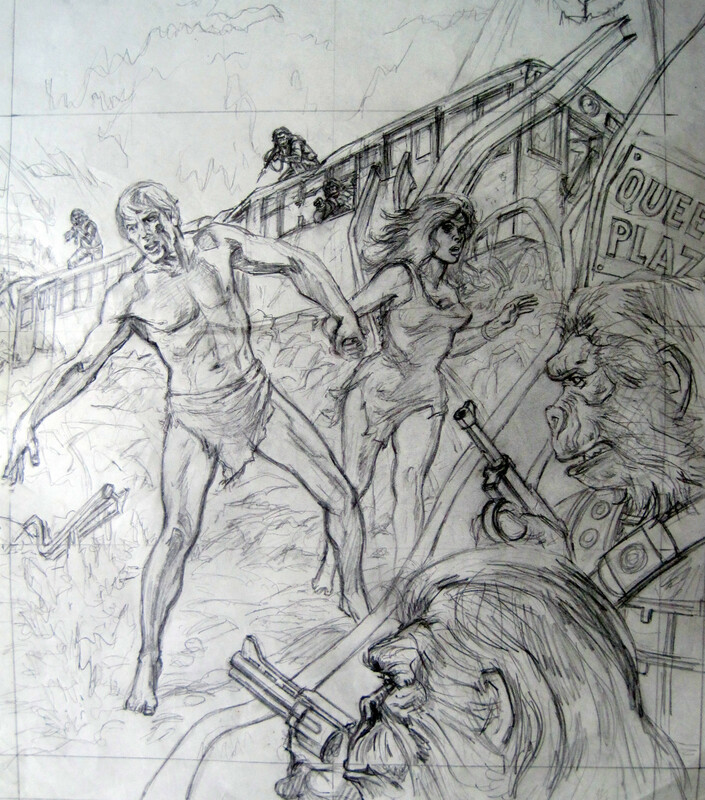 Ink over graphite on Bristol board with an image area of 11.5" x 16.5". In Excellent condition with four pieces of discolored tape. 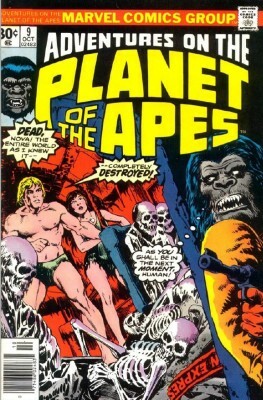 Signed by Ploog in the lower right. In October 2017, Heritage Auctions listed pages of original art from the booklets for the Power Records Planet and Battle booklets. 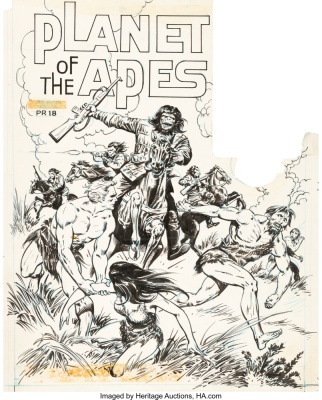 Ernie Chan (attributed), and Nestor Redondo (attributed) Planet of the Apes [Book and Record Set] #PR18 Cover and Complete 20-Page Story Original Art Group of 21 (Peter Pan, 1974). 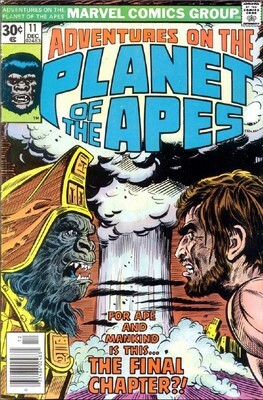 An adaptation of the original Planet of the Apes movie. 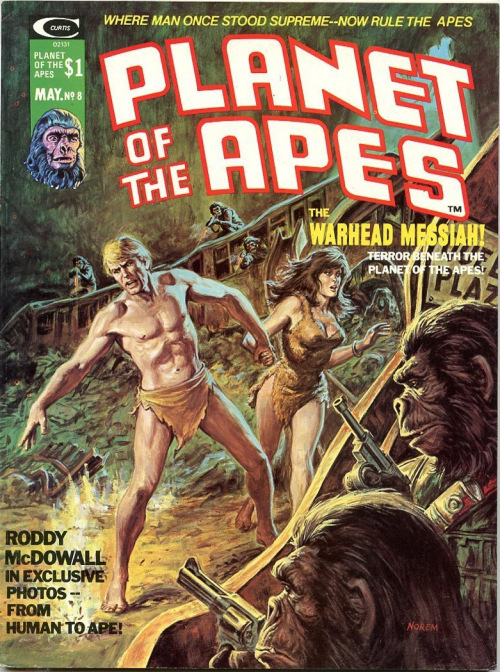 The Power Records adaptation was written by Arvid Knudsen, and the interior art was by Nestor Redondo (with possible help from brother Frank Redondo). Crafted in in ink over graphite on Bristol board with an image area of 10" x 15". The Ernie Chan cover art (ink over blue pencil) measures 10" x 13.25", with a section cut out where "Book and Record" caption box would go. 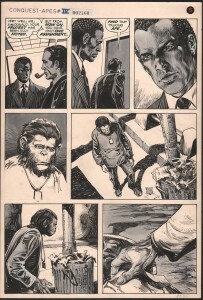 The boards are lightly toned. 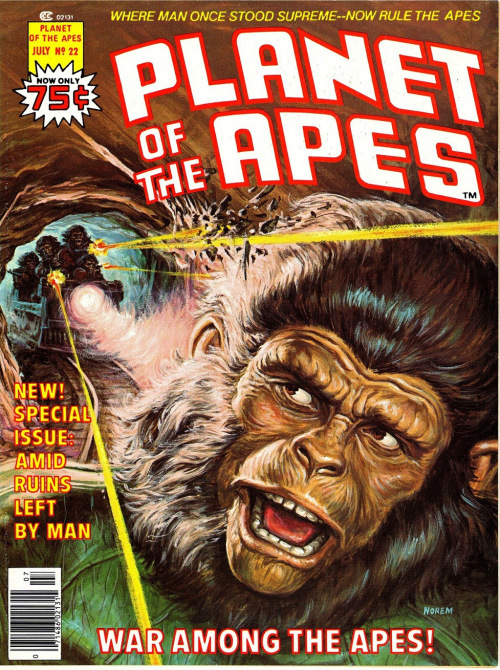 The cover art is in Good condition, and the interior pages are in Very Good condition. *Ding* Turn the Page. 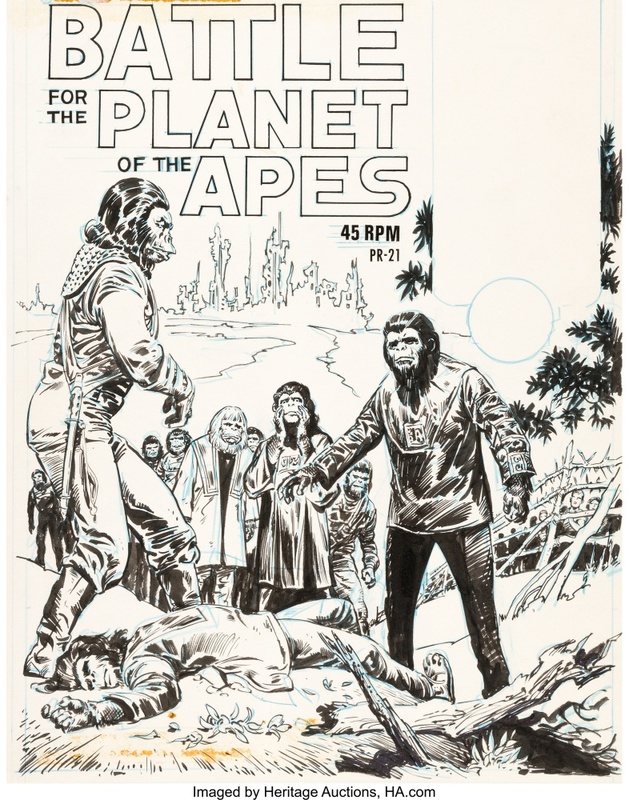 Ernie Chan (attributed), and Nestor Redondo (attributed) Battle for the Planet of the Apes [Book and Record Set] #PR21 Cover and Complete 20-Page Story Original Art Group of 21 (Peter Pan, 1974). 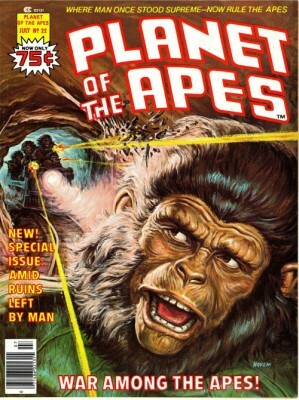 An adaptation of the movie sequel Battle for the Planet of the Apes. This Power Records adaptation was written by Arvid Knudsen, and the interior art was by Nestor Redondo (with possible help from brother Frank Redondo). 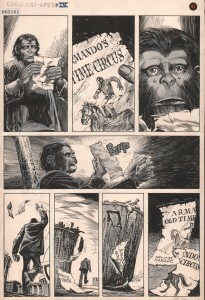 Crafted in in ink over graphite on Bristol board with an image area of 10" x 15". 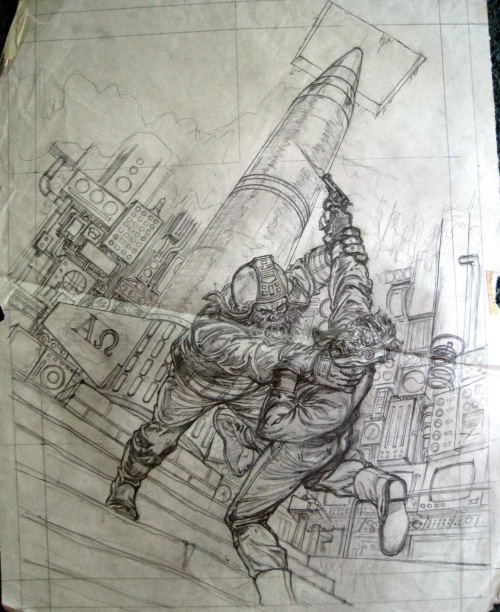 The Ernie Chan cover art (ink over blue pencil) measures 10.5" x 13.5", with a couple of missing paste-ups (leaving glue residue in their place). The boards are lightly toned (more so on the pages than cover). They are all in Very Good condition. *Ding* Turn the Page.